Tel:(067) 62776 / 22427/ 23544. 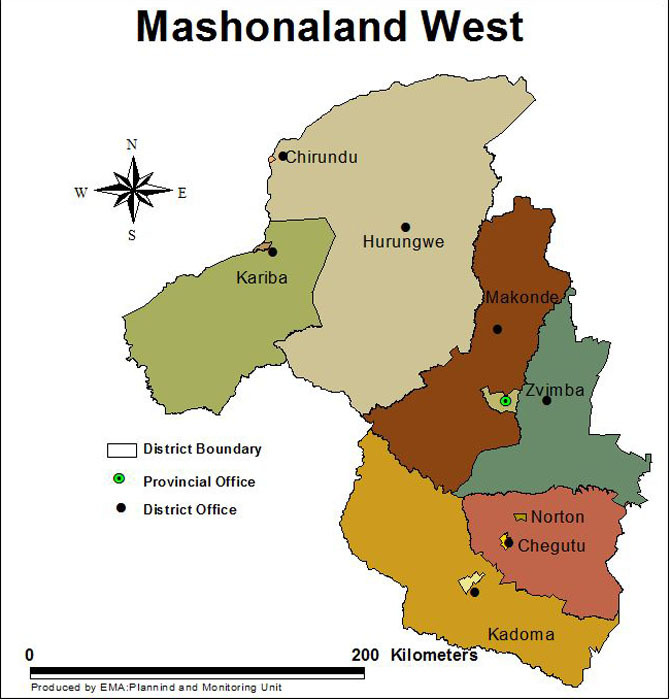 Mashonaland West, has an area of 57,441 km² and a population of approximately 1.5 million as noted by ZIMSTAT (2012) with Chinhoyi as the capital. It is located in the North western part and comprises of seven districts namely; Hurungwe, Kadoma, Zvimba, Makonde, Kariba, Mhondoro and Chegutu. Major environmental issues identified in this province include gullies, wetland degradation, artisanal mining (gold) and the existence and spread of invasive alien species. Areas with bare and unprotected soils resulting in sheet erosion were noted to be the worst affected by gullies. Other human induced factors noted as contributing to gully erosion and are area specific were illegal gold panning activities, brick molding and overspills from constructed dams. Stream Bank cultivationis found in both communal and resettlement areas of Mashonaland West Province with a cumulative length of rivers affected being 30km. Rivers affected include Tsvanzva, Mvuma, Hunyani, Maradzo and Angwa Nyadara, Hurenje, Kemazi, Ume, Marova, Namaziya, Sibilobilo, Nyanyana and Sangano. The major drivers of stream bank cultivation are water shortages and limited sources of livelihood which leads to over dependence on agriculture as it has become a safety net for survival for the communities. Another driver is tobacco farming which requires the seed beds to be started earlier before the rainy season. In Kariba district, the impacts of stream bank are mainly noted to be water shortages for livestock, wildlife and human livelihoods. Most rivers in the district which have been affected by siltation are now invaded by illegal sand extraction activities leading to serious land degradation and gully formation. Siltation is associated with stream bank cultivation. Gully erosion has been recorded varied from one area to another with variations occurring even within the same district. The major cause (36%) recorded for gully erosion in the province was soil erosion occurring naturally on exposed soils. This is noted in Kariba, Kadoma, Mhondoro and Hurungwe districts. Notably these areas are sparsely vegetated and are generally hot and drier compared to other regions in the province. Poor soil structures have also contributed to gully erosion in the same region. These areas have sodic soils which are affected by chemical erosion and rehabilitation of the same is usually very difficult. Other important factors leading to gully erosion observed were poor drainage on public roads. The total amount of soil lost due to gully erosion is 12 466438.1m3 and total area covered by the gullies is 40.08501hectares. Gullies constitute 13 percent of all the total environmental issues noted within the district. The main drivers causing gully erosion are population growth and distribution (human and wildlife) as well as economic activities i.e. tree cutting, poor road construction, agriculture. Invasive alien speciesin the province includes Lantana camara which is found in clusters around grazing fields, along rivers and along the road .Communities in the districts where the invasive species is most prevalent are aware of its nature and the negative impacts associated with it. Lantana Camara is disturbing the ecosystem as it out competes indigenous vegetation species in the province. If no eradication measures are taken lantana camara, has the potential to spread to other parts of the province. In Makonde district Mhangura and Zebra villages, lantana camara is used as live fence around gardens and homesteads. Lantana camara competes for resources with, and reduces the productivity of pastures and forestry plantations and is highly flammable in the event of a veld fire.